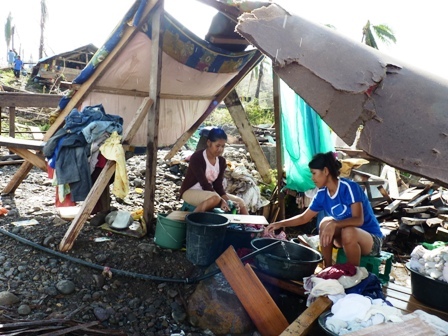 Survivors of Typhoon Bopha, which struck the southern Philippine island of Mindanao on 4 December, face a bleak Christmas more than two weeks on. “My parents and my one-year-old baby died when our house collapsed on them and they were buried under the debris,” Richee Antulan said outside the remains of her home in Banganga, a municipality now viewed by many as “ground zero”. She is among 6.2 million people affected by the typhoon, the most powerful to hit the country in 2012. On 7 December President Benigno Aquino declared a state of national calamity. According to the National Disaster Risk Reduction and Management Council (NDRRMC), 1,050 people were killed, over 2,000 were injured, and more than 800 are missing. Of the 168,227 homes damaged, over 65,500 were totally destroyed. The estimated value of property damage is over US$839 million. Close to 12,000 people are still in 43 evacuation centres. “The devastation was total,” NDRRMC head Benito Ramos told IRIN. Many public buildings that were designated areas for evacuation centres were severely damaged, mostly with roofs blown away. “We urgently need tents and tarpaulins. We have gone as far as gathering tarpaulins from old advertising billboards in Manila to bring down to the affected areas. We want the survivors to have some kind of shelter before Christmas,” said Ramos. In Baganga, where the storm first made landfall, not a single public building is usable. “We have no evacuation centres. In Baganga, all 31 schools were damaged, all the churches, too. We estimate that 95 percent of the 18 villages [in this municipality] have been totally destroyed,” said Rowena Abayon, a second lieutenant in the Philippine Army who was manning the incident command post in Baganga. “The most immediate need now is shelter. The people need tarpaulins to at least give them shade or protect them from the rain,” said Wilson Mondal, a field delegate from the International Committee of the Red Cross (ICRC). “[Without temporary shelter], the food distributions they receive will get wet. Tarps will also keep their kids from getting wet and getting sick,” Mondal said. ICRC has started distributing two tarpaulins (measuring 4 x 6 feet) as well as food and non-food items to each family in the three most affected municipalities of Baganga, Cateel and Boston. An estimated 90 percent of affected people in the area are in need of additional assistance, he said. “The people here are resilient, but will require support for quite some time to get back on their feet,” David Carden, head of the UN Office for the Coordination of Humanitarian Affairs (OCHA), said from the affected area. On 10 December, the government and the UN Humanitarian Country Team launched the six-month Bopha Action Plan for Response and Recovery, requesting $65 million to assist nearly 500,000 of the most affected people. “Emergency shelter support is a priority, as is water and hygiene kits, along with debris removal,” Carden said. Meanwhile, the local Department of Social Welfare and Development (DSWD) says it has begun the first phase of establishing temporary shelters for 3-6 months for those in the worst affected area. Sixty bunkhouses are now slated to be built in the three worst affected municipalities (20 in each). Another 21 bunkhouses will be constructed in the other affected areas of eastern Mindanao, in Compostella Valley. “Each bunkhouse structure, which measures about 178 square metres, will have 10 rooms, two bathrooms, a kitchen and a washroom. One room can fit one family,” said DSWD coordinator Varnell Dagansan. The target date for completion of the bunkhouses is 30 December, though Dagansan doubts this deadline will be met: The nearest source of construction materials is the city of Davao, which is a 5-8 hour drive away. Nearly half of the 225m-long Manorigao Bridge, one of area's main bridges, was damaged, hampering road transport in the Baganga-Cateel-Boston area. “The hardest part is getting construction materials to the construction sites. It takes 2-3 days for them to get here,” said Dagansan. The government reports at least nine bridges and one road remain impassable in the region as of 21 December, with many areas still experiencing power outages.